Remifemin® / 60 tabs - Nature's Way®. Ideal for women choosing not to take estrogen. For best results, take 1 tablet in the morning and 1 tablet in the evening with water. Expect noticeable results within a few weeks of use. No propylene glycol or hormones. Remifemin®, RemiSure™, "Take 1 in the Morning and 1 in the Evening" and associated butterfly logo & pill designs are trademarks of Schaper & Brummer GmbH & Co. KG. Why does Remifemin contain lactose? What is the actual lactose (milk) content? Remifemin® was really helping, but now my symptoms are starting to come back. Can I increase the dosage? Taking 3 tablets twice daily has been shown to be as safe as taking one tablet twice daily, however, because each woman's health status is unique, we recommend that you consult with your doctor about whether or not you should take more than the recommended daily amount. How do I know Remifemin® is safe? For nearly 60 years, Remifemin® has been tested in clinical trials. No drug interactions have been observed, and adverse events have been limited to mild—and quickly passing—stomach upset. 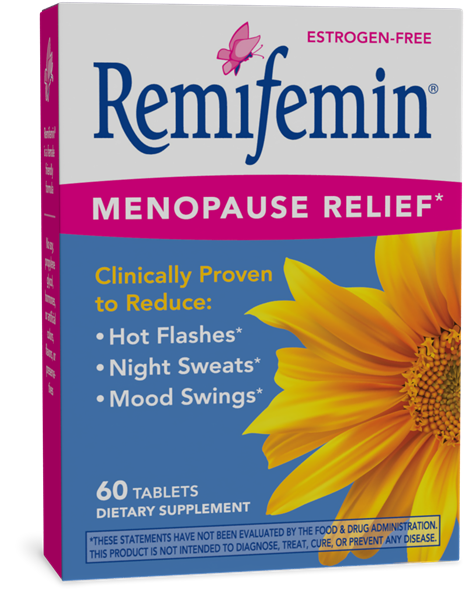 How is Remifemin® different from other black cohosh products? The RemiSure™ black cohosh in Remifemin® is an isopropanolic extract. This yields a more complete spectrum of compounds than black cohosh produced by other extraction methods. It is also the most clinically studied form of black cohosh, with over 90 published trials and research papers. Should I take Remifemin® with food or on an empty stomach? It’s up to you—whether you take Remifemin® with or without food is matter of personal preference and convenience. It can be taken before, with, or between meals and won’t impact the effectiveness of the product.